In 1983, Jane Alexander was a sixty-one-year-old widow and mother of six children who lived in Marin County, California, with her romantic partner, Tom O’Donnell. A family friend for twenty-five years, Tom had captivated Jane with his carefree lifestyle and charming personality. He helped her through her grief after her husband’s death and promised her a happy future. But on October 23, Jane’s aunt, Gertrude McCabe, was found brutally murdered in her San Jose home. And the killer – Tom O’Donnell – fled with over $10,000 of Jane’s cash. Soon she discovered he had bilked her out of more than $200,000 of equity in her home, which she was about to lose. worked diligently to bring her aunt’s murderer to justice. For thirteen years she fought through the bureaucratic red tape of the criminal justice system even as she struggled with bankruptcy. 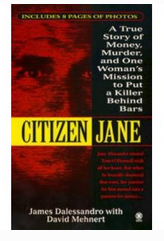 She would not stop until her former lover was behind bars…..
“Citizen Jane” is her story. Update: Tom O’Donnell was denied parole at his 2007 parole hearing and died in prison in January 2010.